Greek lemon-egg soup or avgolemono is one of the go-to recipes when the Accidental Locavore has a cold. The other great cold remedy is any form of albondigas. This week’s cook-along recipe was taken from a recipe from Food & Wine magazine for Tangy Lemon-Egg Soup with Tiny Meatballs, but after making it, a better bet would be the meatballs from the Food & Wine recipe, combined with the version I’ve always made, Greek lemon soup from the Silver Palette Cookbook. The Silver Palette recipe is easier, and I think better tasting. You can do it with or without the meatballs. Pour the broth into a pot, and bring it to a boil. Pour in the rice, reduce to a simmer and cover. Cook for about 25 minutes until the rice is just tender. Meanwhile whisk the egg yolks and the lemon juice together in a small bowl until well combined. When the rice is done, remove soup from the heat, and ladle 2 cups of hot broth into the lemon/egg mixture. Whisk to combine, and whisk this back into the remaining soup. Return the soup to medium heat, and cook until soup is just steaming. If you’re adding the meatballs, they go in here, cook for 8-10 minutes to cook the meatballs. Do not let it reach a boil. Season to taste. Serve and enjoy. 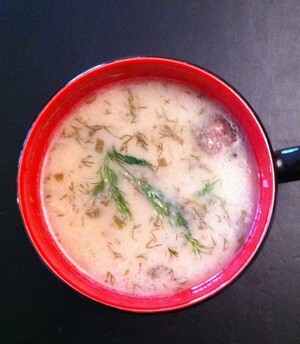 In a medium bowl, mix the lamb with the onion, mint, dill, lemon zest, salt and pepper. Form into 1″ meatballs. Lightly dust with flour, shake off the excess and drop into the soup. Cook for 8-10 minutes until the meatballs are cooked through. Serve and enjoy.